Qantas doesn’t fly out of Seattle, so my options to fly to Sydney from the west coast were out of San Francisco, Los Angles, or Vancouver. 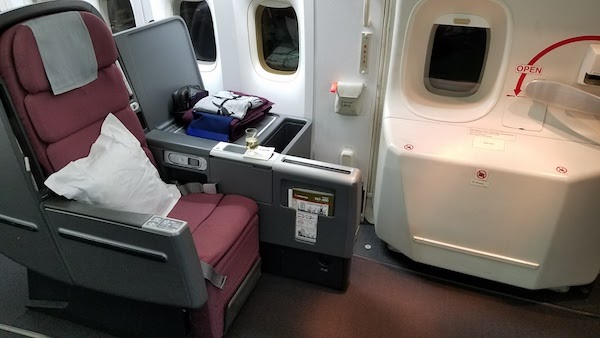 I was unable to find premium award seats with Alaska miles out of LAX or SFO, but there was Business Class available for Christmas eve out of Vancouver. For 50,000 Alaska Mileage Plan miles I was able to book SEA-YVR-SYD-MEL; everything but the first leg in Business. I didn’t realize it at the time but the YVR-SYD route is seasonal (summer and winter). Apparently it is a favorite of the flight crew and goes to the most senior staff. The flight leaves at 8:00pm PST from Vancouver and arrives in Sydney at 6:15am. It is actually the perfect time to get a good nights rest. As I was flying on Christmas Eve and landing on December 26th, essentially meaning I miss Christmas, the flight was quite empty. 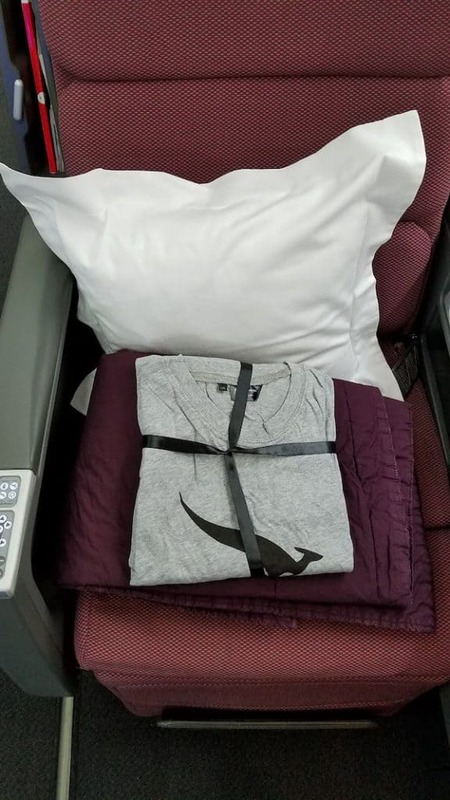 The Qantas 747-400 Business Class is divided between the upper deck of the plane and the front of the lower deck. The upper deck seems to fill up first, then the nose, then the large section under the upper deck. On my flight the upper deck was nearly full while the rest of the Business Class was practically empty. 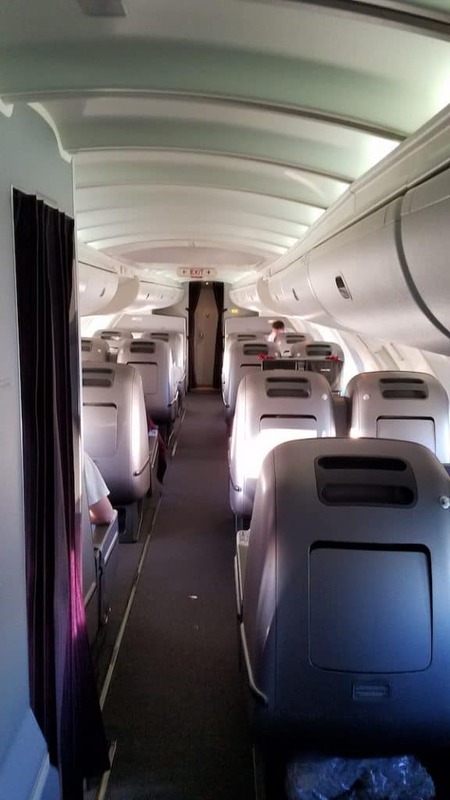 There is no First Class on this particular configuration of the Qantas 747-400. I selected seat 5B on the lower deck. 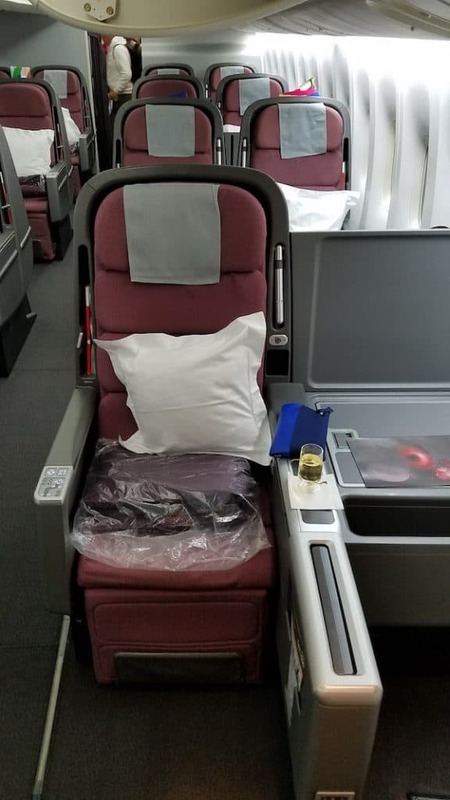 It is the first row of the larger Business Class cabin. The upper deck is 2-2 layout and is quite private. The lower deck is 2-3-2, just about the worst Business Class layout. Except for row 5. Because of the shape of the plane, row 5 is 1-3-1. That means that 5B and 5J are both aisle and window seats. No neighbors. Tons of storage and legroom. 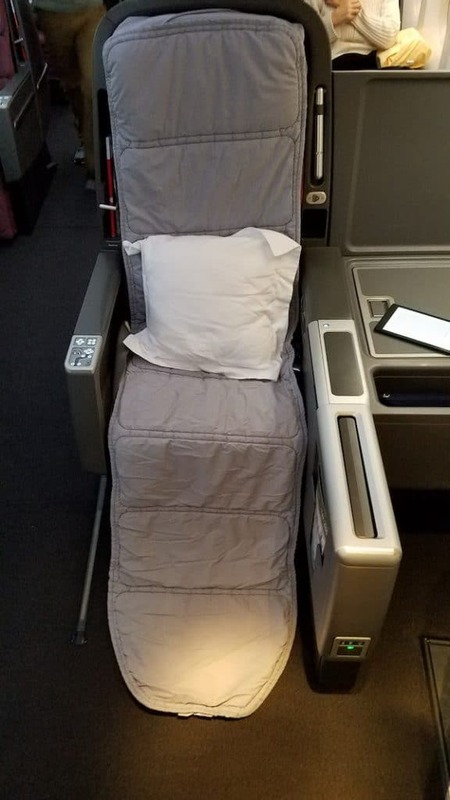 The ideal seat for a single flyer! 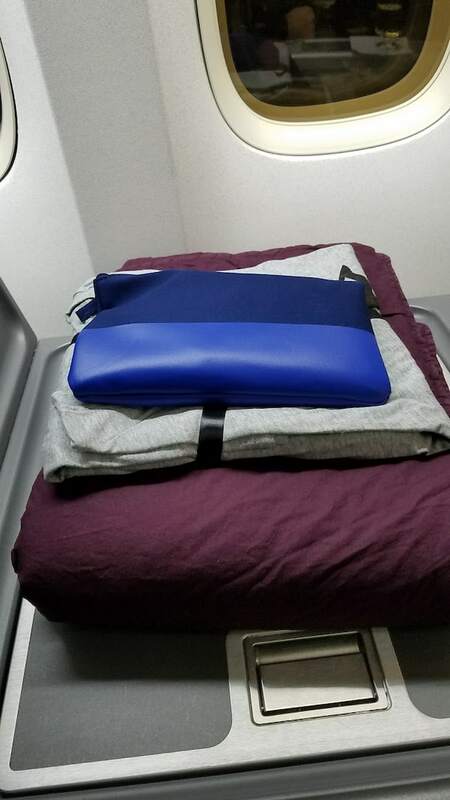 This particular seat had a deep storage bin next to it as well as a shallow locker. The locker could be used as a table. 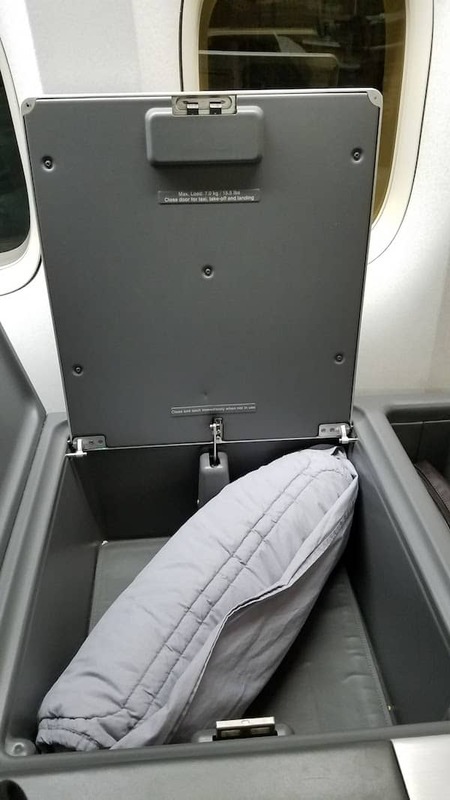 Inside the locker was a mattress that could be put on your seat after takeoff. One outlet and USB was at the seat. 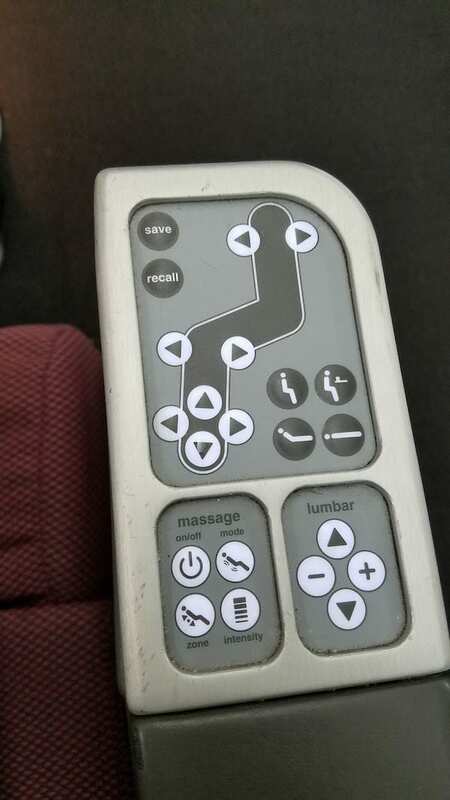 The seat controls allowed for lie flat position and also had a massage function. 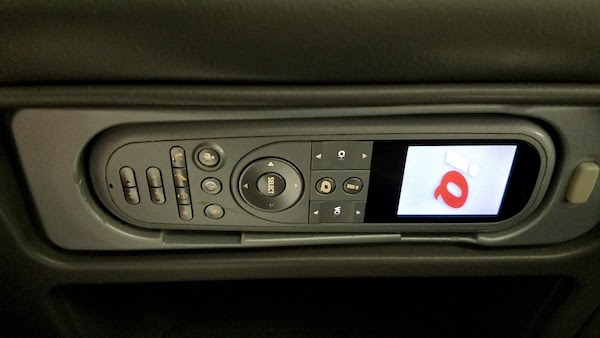 The inflight screen pops out of the armrest. It is touch screen but can also be controlled by remote. 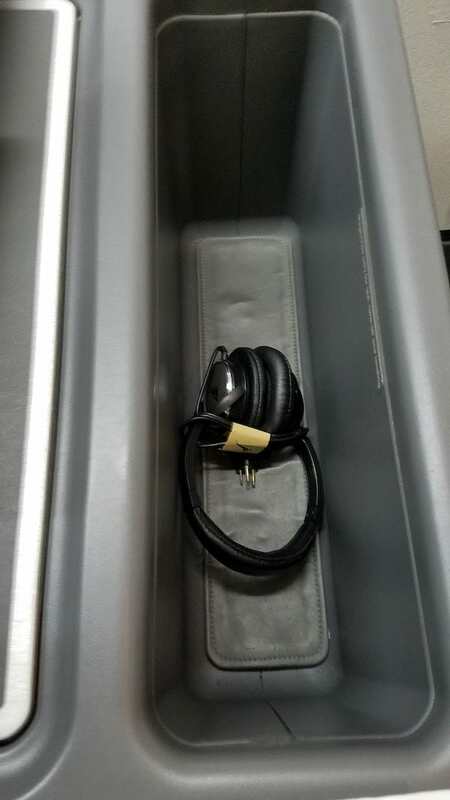 Each seat also had a set of headphones though I chose to use my own. 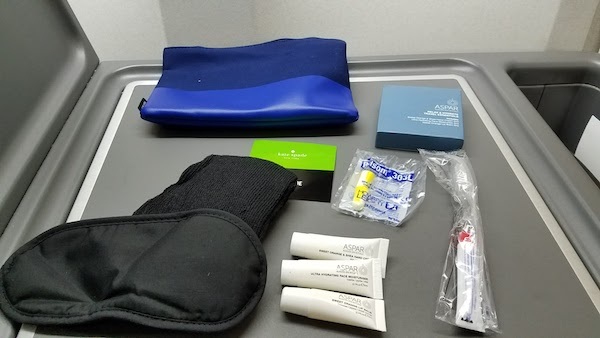 On each seat was an amenity kit matched to the gender of the passenger. Kate Spade for female, Jack Spade for male. Inside was the standard amenities: socks and blindfold, earplugs, face and body lotion, lip chap, toothbrush/paste. 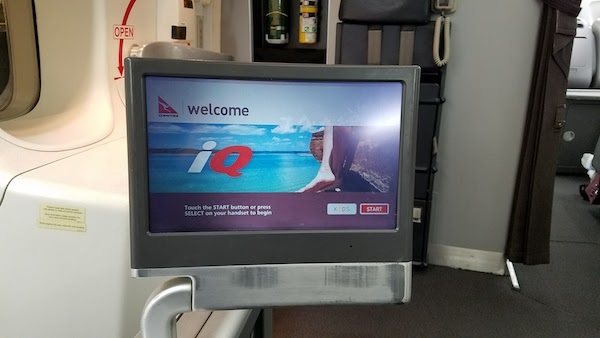 The cosmetics were Aspar which Qantas seems to use across the board. Also on the seat were a comforter and pillow. Both were good quality. Before takeoff the crew came by with pajamas. Yes, you are supposed to keep them if you like. 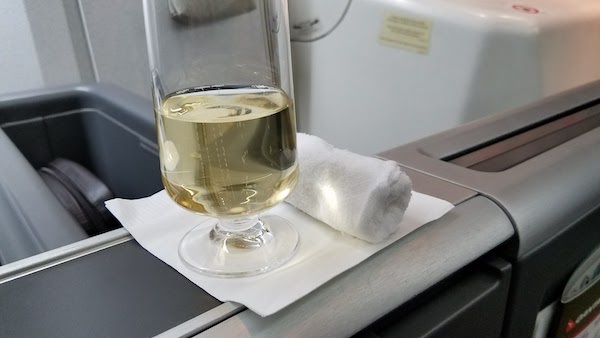 Pre-departure champagne was served (though I’m not sure the brand or even if it was champagne) along with a hot towel. Because of the light load it was a quick boarding process and we were taking off on time. Dinner was served after we hit cruising altitude. Perhaps the most disappointing part of the flight was the food. 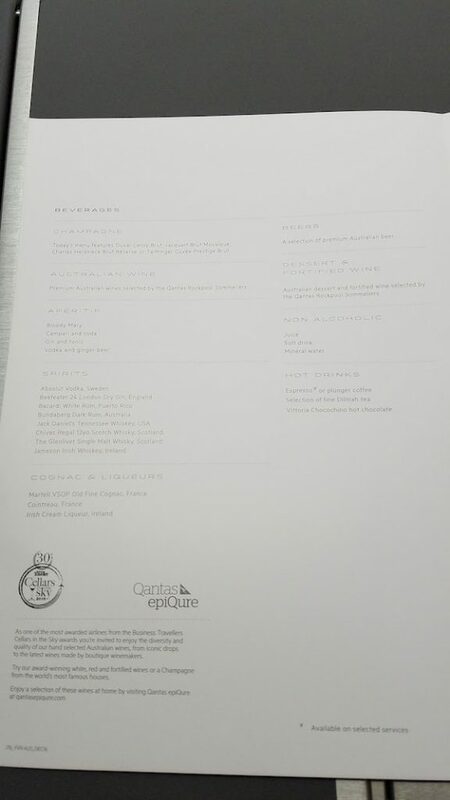 As this is only a seasonal flight, my guess is that they use catering already at Vancouver instead of designing their own meals and training up the catering staff to Qantas standards. 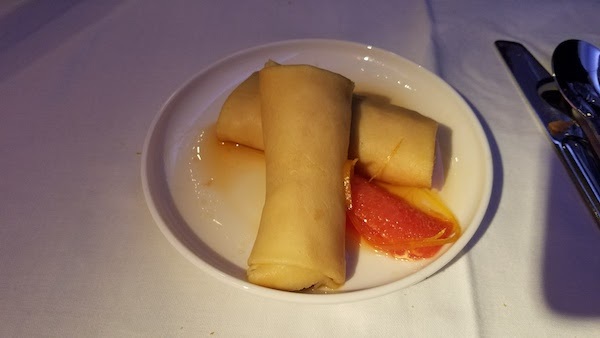 My first choice of both dinner and dessert had not been catered on the flight. For dinner I ended up having the Moroccan Chicken Pot Pie. It was served as one course with the bread and salad. 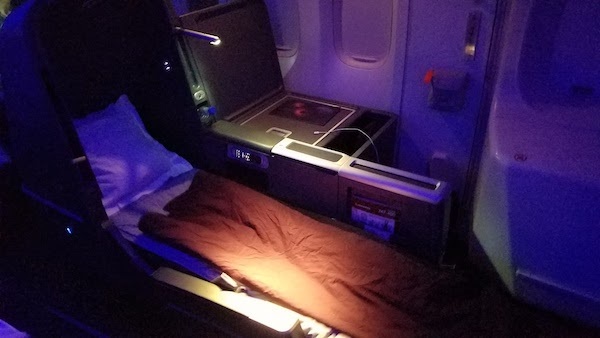 It definitely could have been served in Economy as well; nothing special about it. For dessert I ended up with the chocolate “crepes”. Quite uninspiring. 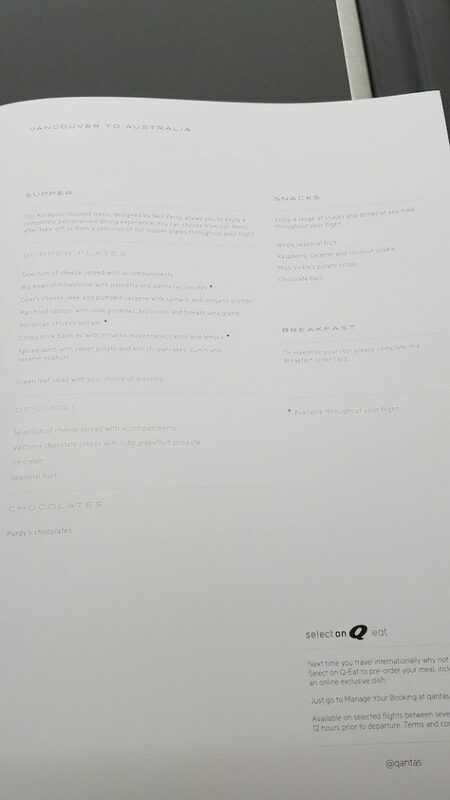 Breakfast orders were taken shortly after take off by filling out a menu choice card. 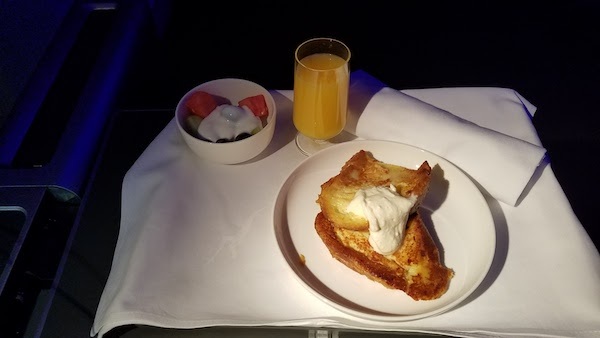 Served just before landing, I had the French toast with a side of yogurt over fruit. The French toast was very soggy. 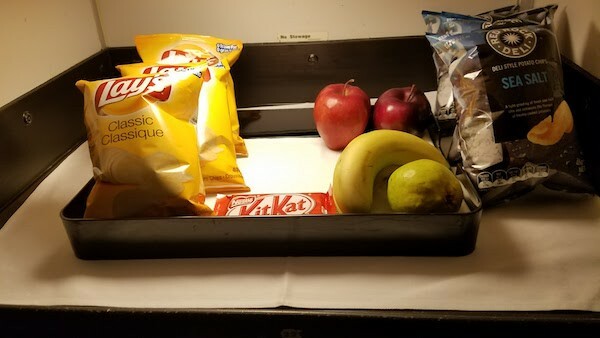 There was a snack bar during the flight where you could help yourself. 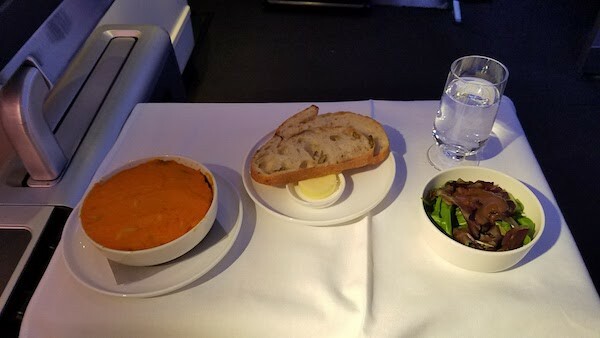 I slept for a good chunk of the flight so I didn’t notice if there was much inflight service between meals. But overall the attendants were friendly. 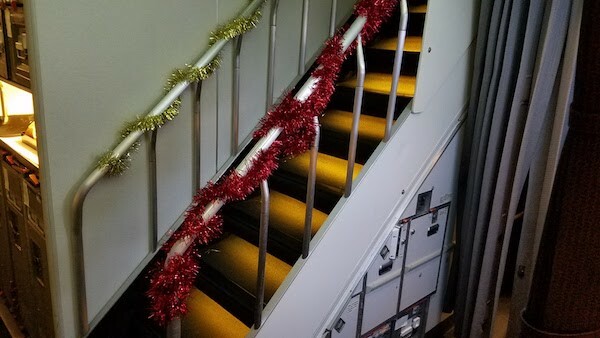 As it was Christmas they even decorated the stairs and during boarding wore reindeer antlers. 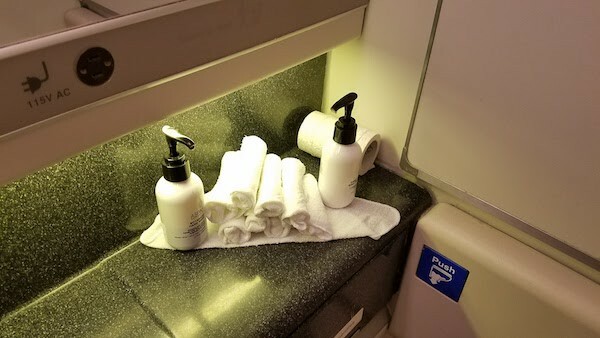 The restrooms were mostly clean and stocked with cloth towels and “spa” type amenities. Overall I wouldn’t hesitate to fly Qantas 747-400 Business Class again, or really any Qantas flight. 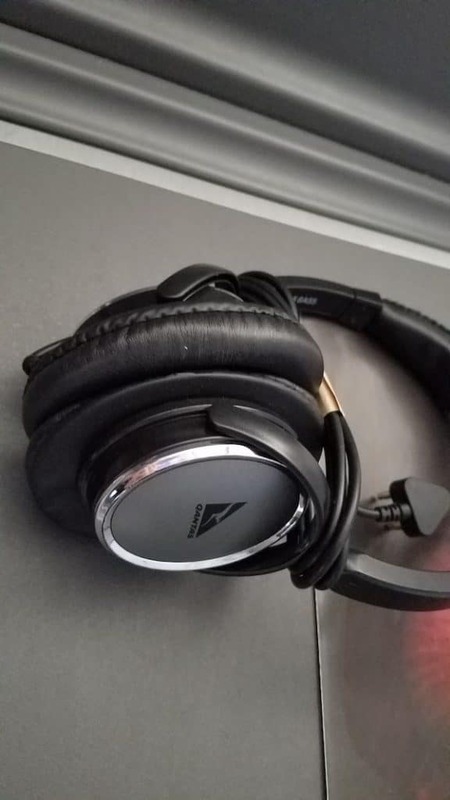 It is not an amazing product, but hands down beats any US airline I have flown. I don’t know how much longer the 747s will fly, so it is a bit fun to get a chance to ride on one when possible. 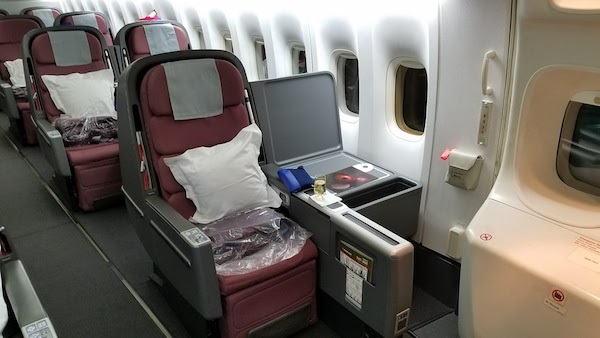 50,000 Alaska miles is a great deal for this flight, especially considering you can make a free stopover in Sydney before heading anywhere else in Australia. I live vicariously through you man!